Ideal for training along a wall or trellis. Produces juicy sweet berries from August to October. Stunnig white summertime blossom which provide a nectar feast for all friendly insects. Delivered as a large well established plant in 3L pot, ready for planting out to final position. 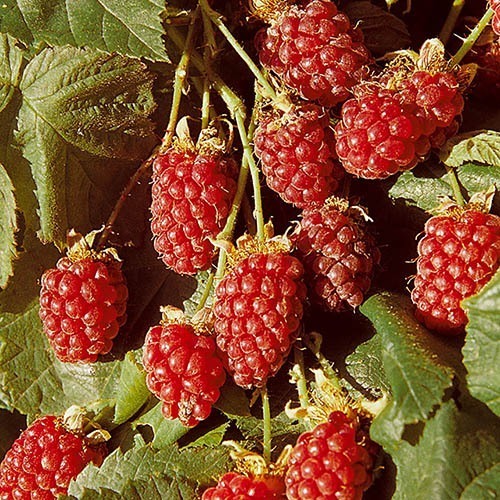 One of the early so called 'hybridberries' resulting from a raspberry x blackberry cross, Loganberries are a splendid plant to train along a wall or trellis. It produces juicy sweet berries from August to October with an aromatic tang and larger and longer that it's raspberry parent. These are preceded by white summertime blossom which provide a nectar feast for all friendly insects. To enjoy the berries at their sweetest be patient and pick when they are purplish red and perfectly ripe, they're lovely eaten fresh and make lovely preserves too. This is a vigorous plant and needs space to thrive, allow 2-4 metres along wires or trellis and you'll enjoy bounteous yiels every year. Once fruiting is over prume away old canes leving freshnew growth in place as these will give fruit the following summer. Delivered as a large well established plant in 3L pot. Ready for planting out to final position.